Grown-up MMT synthesis from the RADIAS: 2 oscillators per voice, sawtooth, pulse, triangle, formant, noise, DWGS waveforms, noise generator, and external audio from the two onboard jacks selectable as an input. As with the RADIAS, sawtooth and pulse are borrowed from the costs-as-much-as-a-car OASYS synth. Modulation and filtering: Cross-modulation, pulse-width modulation, unison voice-thickening, and Variable Phase Modulation — so, in other words, they didn’t strip out features from the RADIAS. Dual filter design with multi-mode resonant filters. Distortion: Drive/waveshaping circuit, with 12 waveshaping distortion modes including hard clipping and decimator. A good thing, too, since I wound up having to route other starter synths (hello, Roland SH-201) through my computer just to get decent distortion. Hard-core, sequenced modulation: The “Modulation Sequencer” allows you to step through 16 modulation steps, routed to various parameters. One thing I Like a lot about Korg is that they think through how this works in performance, so you can easily step forward, backward, loop, and record knob movements. Formant Motion vocoder: The vocoder on the microKORG was lots of fun, and it’s a feature the competition is missing, but it didn’t have the best sound quality. The R3 borrows the 16-band vocoder from the RADIAS. 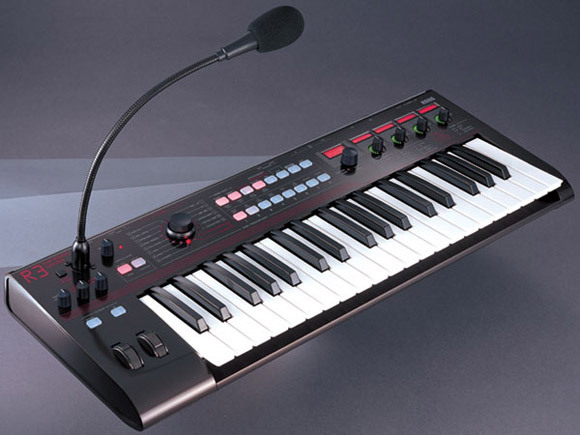 And Korg doesn’t mess around: there’s an actual XLR, selectable audio inputs, AND a built-in gooseneck mic that looks less fragile than the microKORG’s. FX: Two-band EQ and two insert effects for each timbre, plus a master effect with reverb and delay. Delay and LFO can be MIDI clock synced. But enough of specs. Let’s take a look at it this way. Everyone has been trying to come up with a perfect starter synth, but the microKORG always had the edge of sounding great and including higher-end synth features and a fun vocoder. The only problem: onboard controls were hard to use, the keyboard was too small to play, the mic was fragile and silly, and there weren’t enough controls that worked well in performance. The R3 could be a serious threat, because it corrects all of these problems. There’s a real keyboard. Onboard controls look easy, accessible, readable, and ready for playing live. There’s a serious arpeggiator/step sequencer for modulation and patterns, and you can actually use it live without getting lost in menus. And the infusion of a new sound engine and vocoder complete the package. To be perfectly honest, of everything I’ve seen at NAMM so far, the Korg M3 looks like the synth I’d actually want to play. I can’t wait to get my grubby hands on one.